Copperwave Gin is distilled in the traditional London Gin method, but with one major exception. To ensure the absolute balance of the 11+ botanicals, the botanicals are distilled separately in flavour groups, then the various components are blended as would a fine wine. This allows us to ensure a high quality product, and manage seasonal variations of the botanicals. 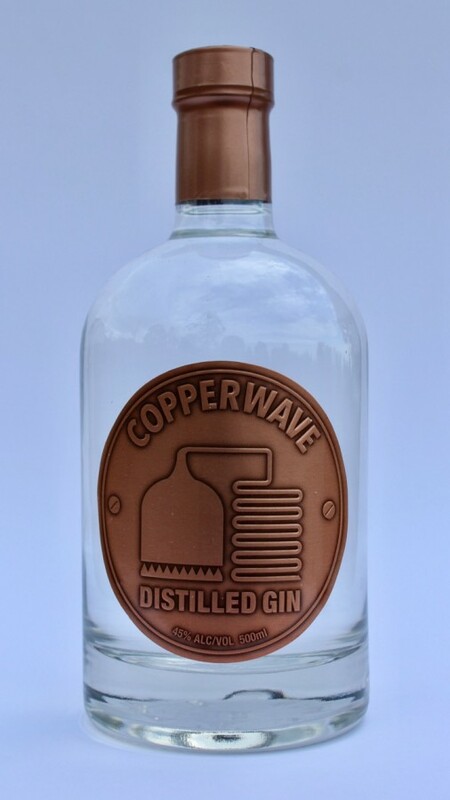 Copperwave Gin is styled as an aromatic Gin, and is prepared at the traditional 45% alc/vol. Botanicals: The botanicals include: Juniper, Coriander, Cassia, Cinnamon, Australian Lemon Myrtle, Star Anise, Cardamom, Nutmeg and a selection of three citrus peels. Copperwave opens with a beautifully aromatic nose of juniper, lemon zest and liquorice. The herbal palate is smooth and deep, filled with an earthy juniper and citrus notes. Copperwave’s middle palette is long and deep flavour with a combination of juniper and the Asian spices coming through. The finish is bold but retains the spirit's brightness and complexity.